We love pizza around here…who doesn’t? My kiddos are regular pizza engineers and they love to build this cheesy treat. 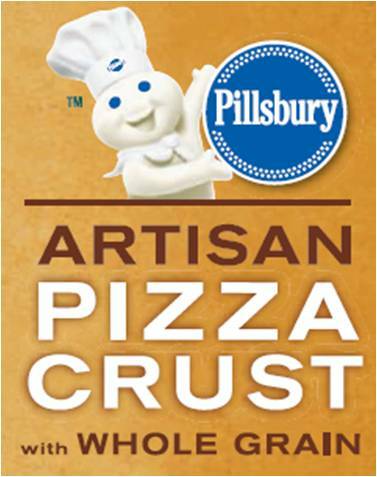 I recently got the opportunity to try Pillsbury’s new Artisan Pizza Crust which has whole grain. I usually try to make my food from scratch, but I find that using pre-made pizza dough saves a ton of time. Since I try to eat whole grains I was eager to try this new product from Pillsbury. 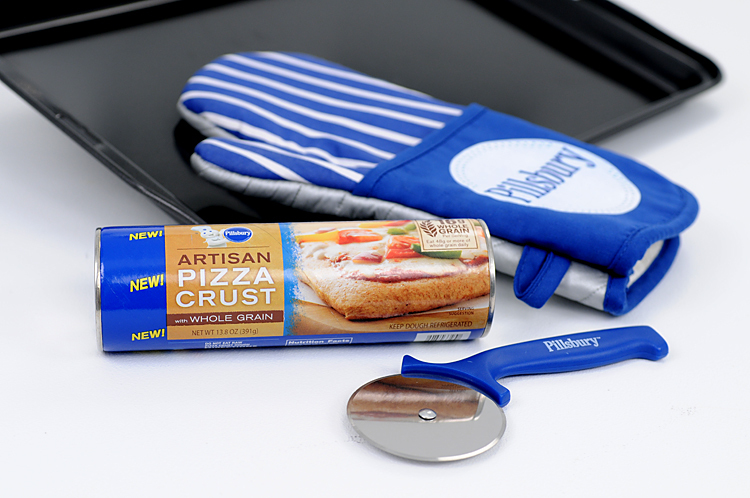 The Pillsbury Artisan Pizza Crust has 16 grams of whole grain per serving and can be found in the refrigerated section of your local grocery store. My family loved this pizza crust. It had an almost perfect texture and was very tasty. I was not sure if my children would like it since it has a crustier denser feeling than traditional dough, but the kids loved it! In fact, the kids asked that I use only this dough in the future. 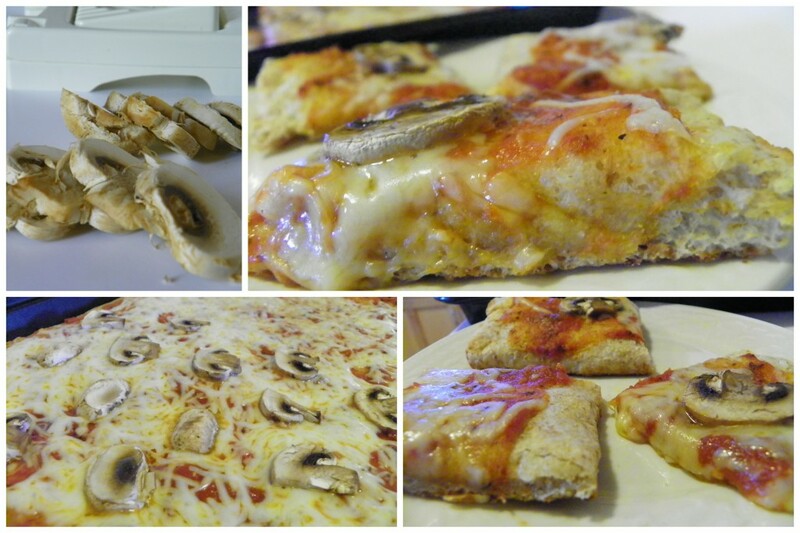 We made our pizza with cheese and mushrooms. What toppings does your family like? Enter to win using the form below. Good luck! If I tell my family i’m cooking its ALWAYS a family night, Pizza will be the icing on the cake!!! I would use it for a pesto, chicken and mushroom pizza, which is something sure to get our little family together and maybe do a movie night. The kids and I love making home made pizzas, putting what toppings we want on them. Would love to win this. I would love to win this… great opportunity to make more pizza’s ~ my husband doesn’t really like pizza but will eat them once in awhile for me so I could say I have to use it up as it is free… I love making different types of pizza and adding different ingredients. I would bring my kids and grandkids over and make out favorite pizzas together, have a family dinner and maybe some board games after dinner! i will use it to make homemade pizza that are healthy and fun & we will all watch movies together! we love pizza! it would be a much loved supper! We would make the pizza together and then eat it. We will use this for Family Night supper. We would make the pizza together. We’ll make a pizza and eat it together! It would make a great family activity to make the pizza together. I plan to let my youngest make dinner all by himself and have the rest of the family celebrate his accomplishment. I would make it together as a family, and then have a movie night. I’ll make a grilled eggplant pizza for family dinner. My son and I would make this together and then pig out together! I’d let everyone put their own toppings on the pizzas. And while it’s baking, pop in a funny family movie and have a pizza party on the LR floor! Thanks. To bring everyone together, I plan on making a pizza on movie night. we would divide into personal pizzas and everyone can make their own cooking together one night! Allow everyone to “decorate” their portion with any toppings they wish. I would make a pizza for movie night. We can incorporate it into movie night. My husband makes homemade pizzas on Sunday nights. This would be great for that. Love to make homemade pizza! we’ll all make pizza together as a family! we’d make our own individual pizzas together! We will build our own section of pizza! Whole grain crust is a grat idea for my lil mans tummy!! Would make the pizza as a family and rent a family type comedy to watch together. Pizza night and make your own toppings brings everyone to the kitchen so to speak. its a good night. Pizza party would do the trick! We have pizza and moive night every friday! this would be a blast! I love making pizza with my girls. So we’ll plan to all cook together and enjoy our creation. Hmmmm, pizza night when the princess comes home for a weekend! We will make a pizza and have game night. It sounds like all I need to do is pop it in the oven! Then smell should attract the whole family! We could have a build your own pizza night. Thanks for the giveaway. use it to cook a big pizza and invite the family over to enjoy. We like having family make our own pizza night. I will have the whole family help make the pizza and then we can all enjoy it together! I PLAN ON HAVING A MAKE YOUR OWN PIZZA NIGHT!!! This would be magnificent for Homemade Piazza Night with the family! Everyone can top it with their favorite toppings. Make a pizza with mozzerella & cheddar cheese, black & green olives, mushrooms, & mild pepper rings. I plan to use it for a pizza and movie night for my family. If I make pizza, everyone sits down for dinner. Then it’s just a matter of keeping the conversation going. I will use it to make the Philly Cheese Steak recipe from Pillsbury. Plan to make pizza together! My kids would love to have a make your own pizza night. My grandson will “take orders” and help with the toppings. Sure would love to see Pilsbury offer some gluten free options! Everyone loves to make their own mini-pizzas including dad, and what better reason to get together to do it than a new crust? Have a pizza and movie night with the family. We will all cook together and then enjoy a movie. Just making the pizza would do it. We are going to get together and make the pizza as a family. We will each pick out our favorite topping. I’ll use Pillsbury Artisan Pizza Crust with Whole Grain to bring the whole family together for dinner by declaring Pizza Night. Thanks for the giveaway! I plan on each person choosing a topping for the pizza. I plan to make a hawaiian pizza and have a game night on a Friday night! We will make our favorite type of pizza together as a family. Let my nieces help put the toppings on! Make yummy pizza, veggie style. Announcing home made pizza tonight – You come and add your fav toppings – should bring them running! We do make your own pizza night at least once a month! a family night where everyone can cook together and share conversation. If I make a delicious pizza with chicken, jalapenos, and Alfredo sauce, believe me, they will run to the dinner table. Dinner family night and maybe throw in a couple of board games! Family pizza night where we make our own! making extra pepperoni pizzas as a family. I would have a pizza party and everyone could put whatever they wanted on their pizza. Thanks for this contest! everyone can have their toppings of choice yum! I would have my kids make dinner for a night! My family loves pizza. All I have to do is have pizza night and they are all here. I would make individual pizza with each family members favorite toppings. This would be great to prepare on game or movie night. Mushrooms, Green Chilies and Feta Cheese. I would make some delicious pizzas and have a movie night with the family.